Diabkil capsule is an effective ayurvedic treatment for diabetes that helps to lower blood sugar levels naturally and gradually reduce intensity of the problem. Poor sugar metabolism in the body leads to high sugar levels which can be highly hazardous for nerves. Since high blood sugar can damage nerves it is extremely dangerous for any organ of the body but it is particularly severe on eyes, heart, arteries and kidneys. 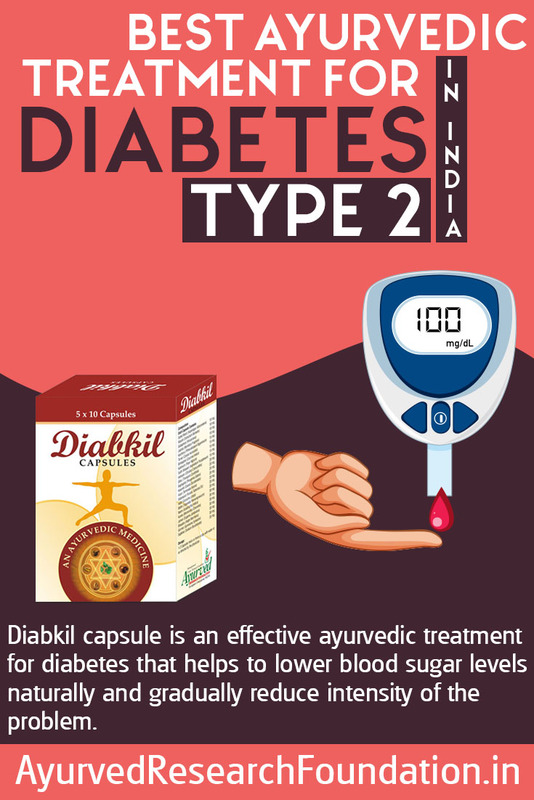 Diabkil capsules are ayurvedic treatment for diabetes which maintain healthy sugar levels and protect health from ill-effects of high blood sugar. Diabetes can be classified into four categories out of these type 2 diabetes is most common which is also called as insulin resistant diabetes. 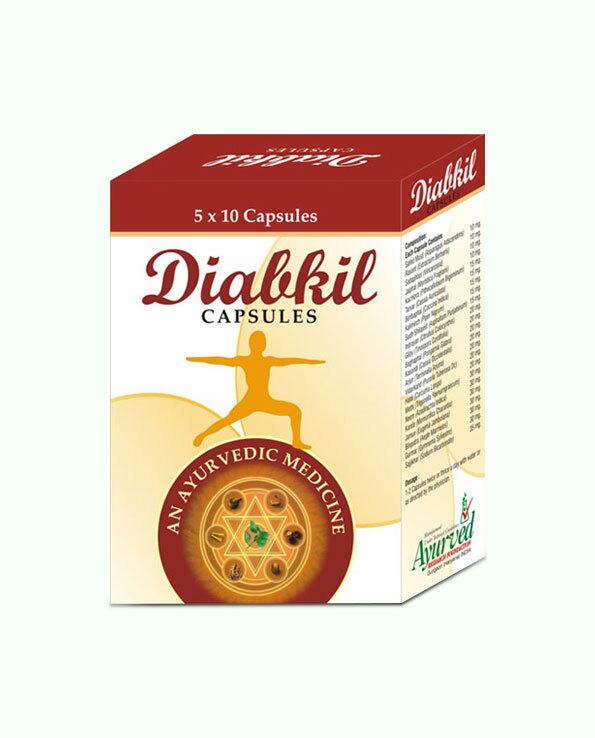 Diabkil capsules provide ayurvedic treatment for diabetes which can handle all four types of conditions effectively. This ayurvedic treatment for diabetes enhances body’s mechanism to keep sugar levels within healthy limits and gradually reduce intensity of the problem. Diabkil capsules possess herbs which are capable of increasing beta cells in pancreas, these cells are responsible for producing insulin which takes sugar from blood and deposit in cells for energy production, when insulin is less or cells do not react to insulin activities it raises level of sugar in blood. By increasing number of beta cells this ayurvedic treatment for diabetes lowers blood sugar levels and also maintains energy levels higher. There are few hypoglycemic substances which when consumed cause drop in blood sugar levels. Diabkil capsules contain hypoglycemic herbs which even in absence of insulin lower blood sugar by metabolizing it for energy. Along with controlling blood sugar levels Diabkil capsules also maintain healthy triglyceride levels and cholesterol to keep heart healthy and blood circulation even. This ayurvedic treatment for diabetes prevents plaque deposition in arteries, prevent hardening of arteries and also maintain healthy clot formation to heal wounds faster and maintain blood flow. Herbs present in this ayurvedic treatment for diabetes maintains healthy urine flow and lower presence of sugar in urine and blood to allow urinary and other systems to function normally. Diabkil capsules not only lower blood sugar levels but protect organs and nerves from its ill-effects. These promote faster healing of wounds, protect vision, prevent pain in legs and body-aches. Diabkil herbal diabetes treatment suppresses cravings to eat sugary frequently and also prevent untimely and frequent hunger. This property of Diabkil capsules help a person in controlling calorie and sugar intake to maintain healthy levels of blood sugar. This herbal diabetes treatment reduces intensity of problem and allows a person to lead normal life by keeping him or her energized and active. This ayurvedic treatment for diabetes is perfectly safe for men and women of all ages. These are made by using herbs which are harmless and provide results by purely natural effects. One can use them for prolonged duration and even with any on-going treatment to gain positive results and relief from the disease. Diabkil capsules possess powerful herbs as ingredients which are – Karela, Gurmar, Neem, Jamun, Bilvapatra, Methi, Sajjikhar, Haldi, Vidarikhand, Giloy, Arjun, Baghphal, Kasondi, Bimbaphal, Shilajit, Tarvar, Jaiphal, Sadaphool, Kali Mirch, Rasont, Kachlora and Safed Musli. All of these herbs collectively provide wonderful results and protect health from side effects of diabetes. These keep energy, immunity and vitality of a person higher and reduce intensity of the problem considerably. You need to consume one or two pills of Diabkil capsules 10 minutes before breakfast and dinner regularly with water. Maintain regularity and avoid misses for faster and complete results. It depends upon intensity of the problem. In case of moderately high blood sugar levels use for 4 months is sufficient otherwise we would recommend use for 6 months minimum. These are herbal ingredients which can be used for longer duration as well. Supplement these pills with regular exercises and active lifestyle. Curtail sugar intake to minimum, also avoid fatty foods and high carb diet as these compounds get converted into calories and sugar after digestion. Regular exercises and eating high fibre diet is recommended to stay high on energy and stamina. We offer easy ways to place your order and make payments. You can send us cheque, DD or deposit cash in our account. You can also transfer through NEFT or pay us on delivery in India. How do you Diabkil? Within how many days will I receive these pills? After receiving your final order we will dispatch your order same day. We supply within 3 to 5 working days in India through FedEx. Strict confidentiality is maintained during order processing and delivery and products are packed in plain envelope so that no details are evident about the product from outside. I was suffering from type-2 diabetes since a long time. Then I started taking Diabkil capsule. It helped me in maintaining sugar level that to without any kind of side effects. It is a great product to control diabetes in a natural manner. Thank you for providing such supplements online. Helped me in controlling glucose level without any side effects!! Amazing Product!! Will order it again!! Very good for lowering blood sugar level!! Thank you for the best offer. Amazing supplements for madhumeha problem!! Control diabetes to a great extent. Value for money!! I have been using this product for almost a month and is real good, put my blood sugar finally down. Such a great ayurvedic pills which maintain blood sugar level and keep healthy. I am very satisfied with it. I have been taking Diabkil capsules for a few weeks. It is lowering my blood sugar level with no side effects. I will continue using this product and would recommend this product to anyone looking to manage or lower their blood sugar levels!